This year’s 2018 Pre-seeding forums at Tarlee and Horsham were well attended with those in attendance keen to hear about trial results, the new varieties and their release dates, marketing options and the all-important agronomy of durum. The University of Adelaide’s Jason Able shared Durum Breeding Australia’s (DBA) results and outcomes for the 2017 season. Jason said “part of the focus [for research] is on crossing high protein and early maturing lines, which will open up the sowing window for durum, while improving the reliability of achieving DR1 with good protein levels”. Jason told us that the DBA trials are showing a number of lines of interest as potential new varieties. While DBA-Aurora has the edge over the other varieties at the Turretfield, Spalding and Mintaro NVT trials, UAD1154197 is showing better performance at Paskeville. The data from ‘Head to Head’ trial analysis, which compares DBA-Aurora and Saintly against any potential new varieties across 28 trials over 4 years, are “looking the goods” with several lines showing comparable or significantly improved yield results. The WQA (Wheat Quality Australia) report card for the new varieties that are to be released in 2018 and 2019, is showing good results for pasta production and consequently both these lines (UAD1154192 and UAD1154197) have been granted ADR classification. Marg Evans An update was provided on the durum lines that Hugh is developing with resistance to crown rot. One line SSD1476-067 has been promoted to statewide S4 trials with Jason Able’s breeding program. Other lines are being tested in S3 trials at 4 sites in 2018 and are also looking good. The resistance is derived from wild Triticum dicoccon and bread wheat. The pasta making quality of these lines will be critical in determining their future. 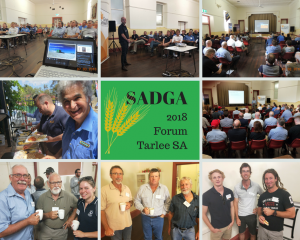 Craig Davis, Agronomist Salter Springs SA gave great value to the audience with his depth of knowledge for growing durum and to working towards getting high value returns for quality and production. Craig suggests your prerequisites for growing a successful durum crop are select paddocks that are fertile and that store good levels of soil water, soil nitrogen needs to be carefully managed, and know your crown rot status. Tim Rethus Grower from Horsham, experienced a steep learning curve with his inclusion of Durum in his rotation in 2017. Why did he grow it? Pricing, currently it is clearly better than bread wheat and its disease package is far superior to bread wheat. However Tim recommends that you constantly monitor your yield potential and adjust your nitrogen applications at the right time to suit the season to boost the protein levels. To combat Russian Wheat Aphid Tim applied imidacloprid as a seed dressing. Current market updates and key trends from 2018 harvest and global factors influencing the coming season were discussed by SADGA Sponsors representatives in Tom Lucas of AGD, Tom Smibert of Glencore and Andrew Mead and Peter Sidley of ADM.
Tom Lucas AGD suggests growers evaluate decisions behind storing lentils, determine your target price and know how long you are prepared to wait for that target price. Tom Smibert Glencore stressed to both Tarlee and Horsham audiences of the value in communicating your interest to grow durum to Glencore to increase the segregations in your region. Andrew Mead ADM reported large wheat stock worldwide are a decent buffer to crop production issues, however demand continues to increase. Barley stocks tighter and volatility may continue. Peter Sidley ADM said the Australian strategic location benefits and supports increasing demand in the Asian markets. Laura Mattiazzi NAB Regional Agribusiness Manager for Western Victoria gave great insight into the Chinese mindset and market place for Australian grains. Laura says to think beyond Victoria, think beyond Australia, think Asia. China is the 2nd largest economy to the US. That to decipher the Asian middle class consumer is to find they are looking for three key areas of premiumisation, health and safety. John Barbetti and Sebastian Recabarren of Imtrade spoke of durum wheat specific tolerance trials of new prosulfocarb formulations as well as multisite baiting trials set up for snails and slugs. Imtrade are seeking assistance of farmer collaborators in 2018, contact John if you’re interested in supporting trial work in your region. Cameron Taylor Birchip Cropping Group reported on outcomes of the durum trials commenced 2017 at Longerenong, Victoria. Initial results have shown durum to be a viable alternative to bread wheat. Mitchel Sanders of Eurofins reported that to date there were no significant differences in yield or protein between durum and bread wheat from the 2017 irrigated durum trials at Finley NSW. Both forums benefited from final panel sessions where speakers, interacting with the audience to provide further clarity to points raised during the morning and to hear from SADGA sponsors David Evans of GrainGrowers about the benefits of the ‘free’ membership to Graingrowers and the products and services they provide and Steve Mellington of Mellco who spoke of how to get access to the area based contract program. At the conclusion of the forums attendees from both locations joined the committee and sponsors for a delicious lunch of San Remo pasta. 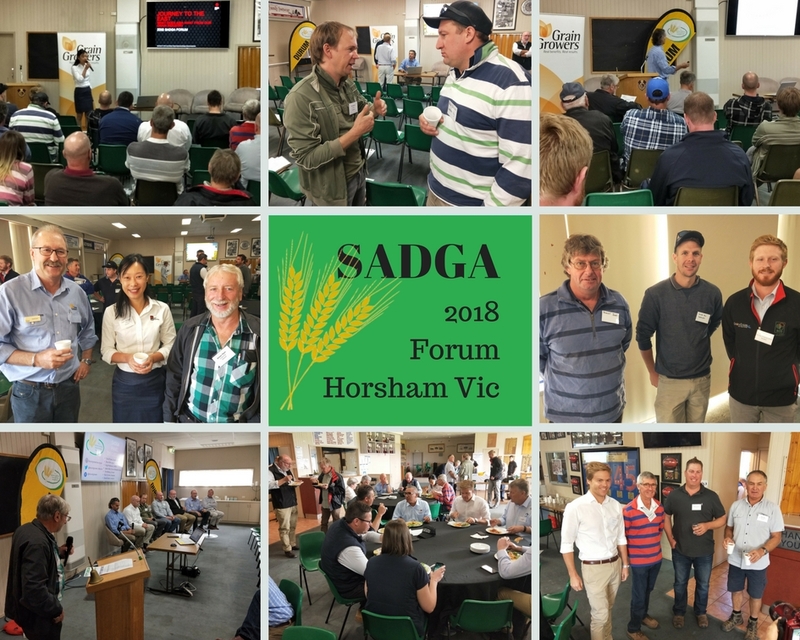 SADGA wish to thank our sponsors for their ongoing commitment to our group and their involvement and support of our forums and cropwalks and wish the growers every success for their coming season. This entry was posted in Events, Forum, Newsletters on April 9, 2018 by Deb Baum. This entry was posted in Newsletters on October 23, 2015 by Ann Price. This entry was posted in Newsletters on November 13, 2014 by Jan Crawford. See August 2014 Newsletter for a message from the Chairman, news from the Breeding Program, Crop progress, SAGIT report, new Treasurer details, Grain Marketer information and much more …. This entry was posted in Newsletters on August 13, 2014 by Jan Crawford. This entry was posted in Newsletters on October 13, 2013 by Jan Crawford.